Let’s start with the obvious question. Why is this cake called “Chocolate Wacky Cake”?? 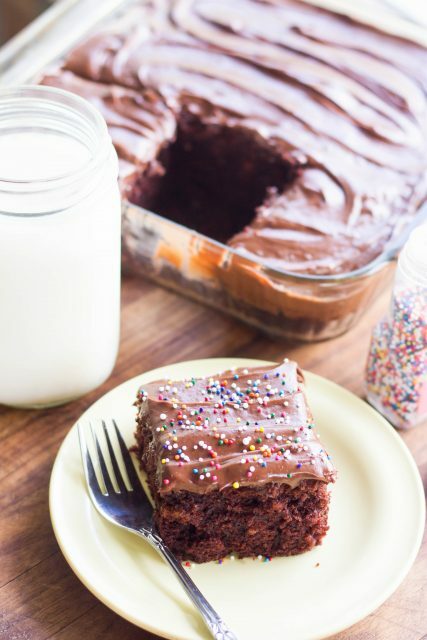 This is a chocolate sheet cake that does not have any eggs, butter, or milk. According to some sources, it was popular during the great depression and WWII. I stumbled across a few recipes where you mixed the dry ingredients together in the pan and then made three separate holes for the wet ingredients and stirred the batter all together right there in the pan! I guess that makes it even wackier?! I chose to mix my ingredients in a bowl, but if you try the three-hold method let me know how it works out =). There wasn’t anything wacky about the taste of this cake though! It was very moist with great chocolate flavor and a light crumb. 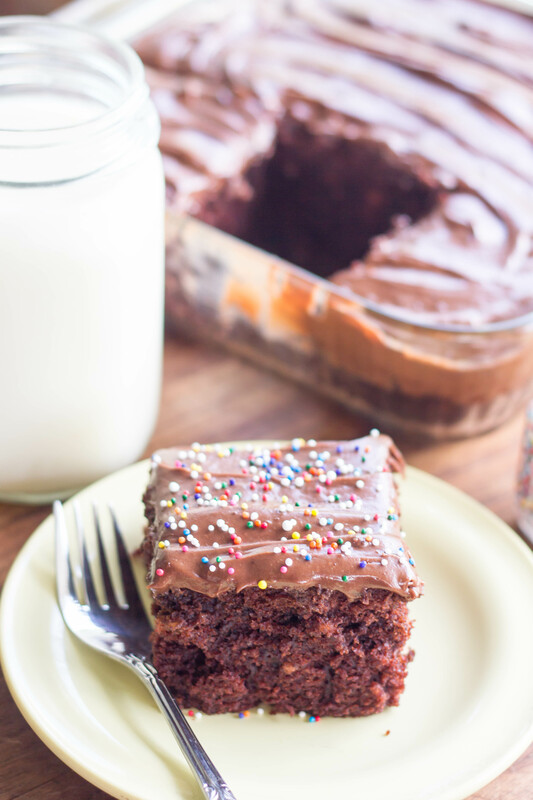 I topped mine with a generous layer of chocolate cream cheese frosting – and sprinkles, of course! 😉 It couldn’t be easier and was a crowd pleaser for sure! Enjoy! 1. Preheat oven to 350 degrees F. Spray 8×8 inch glass cake pan with nonstick spray. 2. In large bowl, whisk together flour, sugar, salt, soda, and cocoa. Add oil, vinegar, vanilla, and water and whisk until just combined. 3. Pour into prepared pan and bake in preheated oven for 30-40 minutes or until tooth pick inserted comes out with only a few moist crumbs. Cool completely before frosting. 1. In bowl of stand mixer with paddle attachment, beat cream cheese and butter until smooth. Add powdered sugar and cocoa powder and beat until combined. 2. Add vanilla and heavy cream and beat on medium speed for about a minute or until frosting is light and fluffy. Spread on cooled cake.